this week I started working on bunnies, but first I had a giraffe to work with on Monday. 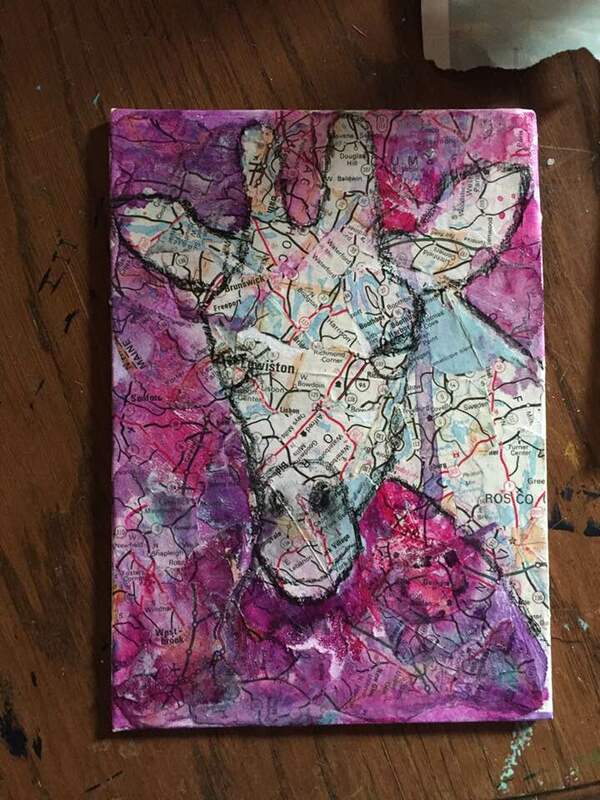 a special long-time friend requested a giraffe, and this sweet girl came easily. I dont yet have maps for all over the world, so no Africa. I instead chose to use a map of my friends state and included the town where she lives. I used pinks and purple, added a metallic jade for shimmer and contrast, and love how it looked. I knew I would play with the jade more at a later stage. I added a heart in the giraffe spots because Peggy finds hearts wherever she goes; in the food she eats, in oil spots, just all over the place in her daily life. when I looked into the symbolism of giraffe it talked about direction (map), and heart, so it was pretty synchronistic! Giraffe is letting you know that you already know the way; to let your foresight take the lead. Follow the direction of your heart. If things feel 'right', then it must be so, but if it feels wrong be sure to look inward making sure it's not just a fear of change creating that feeling. It is not enough to look forward, you must also move in that direction. Tuesday morning had me sketching out some bunnies to paint in time to bring to Bates Crafters Gallery for Easter. then I gave the background a base coat of Diarylide Yellow so I know what's bunny and what's not. then concentrated one one rabbit to try to finish before the day was over. today came and my injury pain and springtime allergies are getting in the way of life. I've decided to concentrate on slowly finishing up this one bun-bun to bring to Bates on Saturday instead of stressing myself out over getting more done. that won't solve any problems, and just creates more tension in me, which will bring on even more pain. I've cut down an old paintbrush this morning in order to be able to more easily paint whiskers and tiny details. hopefully this idea will help those problem areas so I'm not as intimidated and prone to procrastinate those last details. I'm also doing a varnish experiment today. I'm not really happy with what I've been using, as the shine gets in the way of seeing the art in all lights. I bought some matte varnish last night, and today I varnished half of a yucky old canvas ornament. after it dries I'm going to varnish the whole thing to see how the matte only side looks, and if using the matte over the gloss varnish will rectify the glaring shine on paintings that already have been varnished. crossing my fingers!